Features ‘secure lock and key’ technology. INTEGRATED Transfer Solutions’ new Micro Matic Economic Plastic Valve (EPV) is a low cost plastic valve system designed for the safe dispensing of commodity chemicals from drums. It represents the new standard in fully featured disposable, closed dispensing systems. A winner of a prestigious Ameristar 2005 Award from the USA’s Institute of Packaging Professionals, the patented EPV has also recently been UN Group II certified in a range of packages. Released to the market after 15,000 hours of development over a five year period, the EPV is designed to be an economical solution for the disposable container, with a 100% closed liquid transfer environment for liquid extraction systems. Manufactured in HDPE with no metal parts, the extractor valve is engineered for a single trip drum that can be easily disposed of or recycled. It provides the option of container re-use through a controlled container management program, which has the potential to modify container reconditioning protocols, with subsequently lowered packaging costs. The mating coupler is multi-use and designed to be product or brand specific and very much user-friendly. In addition, the HDPE construction provides a comprehensive chemical resistant packaging solution. The system's ‘secure lock and key’ technology allows up to 12 distinct colour-coded key combinations, each incompatible with the other, making dispensing the right liquid ‘fool proof’, while improving worker safety and eliminating cross-contamination. EPV's dry disconnect mechanism reduces worker exposure to liquids upon disconnect and eliminates environmental spillage from both the coupler head and the extractor valve. The elimination of spills will reduce workplace accidents and also has the potential to lower insurance costs. 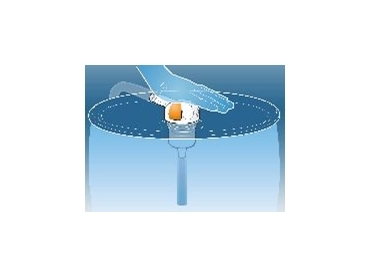 Additionally, drums can be kept upright during dispensing and emptying with no extra handling required to ensure it is completely emptied. Designed with space in mind, the EPV coupler is only 50mm in height when engaged. The user-friendly, re-usable coupler head pivots 360º, simplifying drum handling while staying securely locked. The EPV valve has a standard buttress thread size that fits an increasing range of Australian containers. The EPV adds a new dimension to the Micro Matic Closed system package. In conjunction with the long established stainless steel Micro Matic Drum Valve and its various configurations, now very much part of Agchemical and niche industrial chemical dispensing processes in Australia, Integrated Transfer Solutions are now able to offer a safe, closed system for just about every application.